Page added in July 2008. The inhabitants of Thrace, a historical region between the Danube and the Aegean Sea, were the first barbarians. They were called in such a way by the Greeks, because of their inability to speak Greek fluently (barbarian is an onomatopoeic word representing stammering). Their country was located at the border of the Hellenized world and after Alexander the Great it became part of the Macedonian Kingdom. Its southern part, between the River Maritsa and the Sea of Marmara, was scarcely populated and in 125 AD Emperor Hadrian distributed part of the land to his veterans and he founded a new town which was named after him. 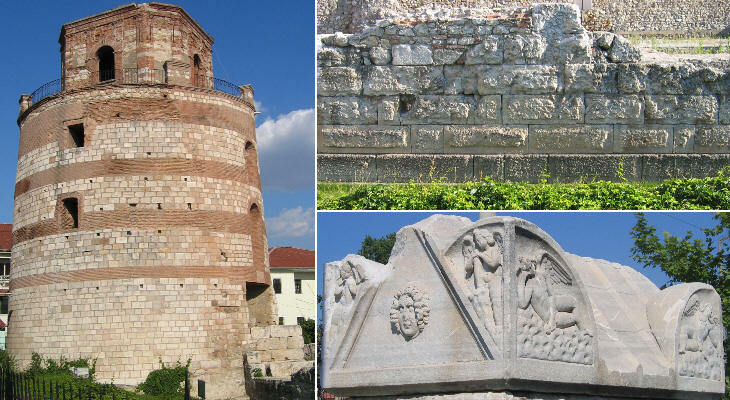 Adrianopolis lay very near the River Maritsa and it was surrounded by a tributary stream (River Tunca). Today the River Maritsa is known by three different names each of them written in a different alphabet: Маriza (Bulgarian in Cyrillic alphabet); Εβρος (Greek); Merç (Turkish). The two rivers per sè were a defence for the town: a much needed defence because no less than ten major battles took place near Adrianopolis (Edirne to the Turks). The most important of these battles took place in 378 AD. Many historians regard its outcome (defeat of the Roman army plus death of the emperor) as the end of the Roman military supremacy and the beginning of a new historical period. The following excerpts from Ammianus Marcellinus (Roman History, Book 31 - 1862 Translation by Charles Duke Yonge) describe the battle and the events which led to it. "The people called Huns, slightly mentioned in the ancient records, live beyond the Sea of Azov, on the border of the Frozen Ocean, and are a race savage beyond all parallel. ..the Huns, after having traversed the territories of the Alani .. and having slain many of them and acquired much plunder, they made a treaty of friendship and alliance with those who remained. .. In the mean time a report spread extensively through the nations of the Goths, that a race of men, hitherto unknown, had suddenly descended like a whirlwind from the lofty mountains, as if they had risen from some secret recess of the earth, and were ravaging and destroying everything which came in their way. And then the greater part of the Goths .. resolved to flee and to seek a home remote from all knowledge of the barbarians; and after a long deliberation where to fix their abode, they resolved that a retreat into Thrace was the most suitable for these two reasons: first of all, because it is a district most fertile in grass; and also because, by the great breadth of the Danube, it is wholly separated from the barbarians. And the whole population of the tribe adopted this resolution unanimously. Accordingly, under the command of their leader Alavivus, they occupied the banks of the Danube; and having sent ambassadors to Emperor Valens, they humbly entreated to be received by him as his subjects, promising to live quietly, and to furnish a body of auxiliary troops if any necessity for such a force should arise. .. foreign ambassadors (arrived and) with prayers and earnest entreaties, begged that the people thus driven from their homes and now encamped on the other side of the river, might be kindly received by us (the Romans). The affair seemed a cause of joy rather than of fear, according to the skilful flatterers who were always extolling and exaggerating the good fortune of the emperor; congratulating him that an embassy had come from the furthest corners of the earth unexpectedly, offering him a large body of recruits; and that, by combining the strength of his own nation with these foreign forces, he would have an army absolutely invincible. ..Full of this hope he (the emperor) sent forth several officers to bring this ferocious people and their waggons into our territory. And such great pains were taken to gratify this nation which was destined to overthrow the empire of Rome, that not one was left behind, not even of those who were stricken with mortal disease. Moreover, having obtained permission of the emperor to cross the Danube and to cultivate some districts in Thrace, they crossed the stream day and night, without ceasing, embarking in troops on board ships and rafts, and canoes made of the hollow trunks of trees, in which enterprise, as the Danube is the most difficult of all rivers to navigate, and was at that time swollen with continual rains, a great many were drowned, who, because they were too numerous for the vessels, tried to swim across, and in spite of all their exertions were swept away by the stream. .. When the Goths who had been conducted across the river were in great distress from want of provisions, the local Roman generals conceived the idea of a most disgraceful traffic: and having collected hounds from all quarters with the most insatiable rapacity, they exchanged them for an equal number of slaves, among whom were several sons of men of noble birth. .. When this series of occurrences had been made generally known by frequent messengers, Sueridus and Colias, two nobles of the Goths, who had some time before been friendly received with their people, and had been sent to Hadrianople to pass the winter in that city, thinking their own safety the most important of all objects, looked on all the events which were taking place with great indifference. But, on a sudden, letters having arrived from the emperor, in which they were ordered to cross over to the province of the Hellespont, they asked, in a very modest manner, to be provided with money to defray the expenses of their march, as well as provisions, and to be allowed a respite of two days. But the chief magistrate of the city was indignant at this request, being also out of humour with them on account of some injury which had been done to property of his own in the suburbs, and collected a great mob of the lowest of the people, with a body of armourers, of whom there is a great number in that place, and led them forth armed to hasten the departure of the Goths. And ordering the trumpeters to sound an alarm, he menaced them with destruction unless they at once departed with all speed, as they had been ordered. The Goths, bewildered by this unexpected calamity, and alarmed at this outbreak of the citizens, which looked more as if caused by a sudden impulse than by any deliberate purpose, stood without moving. And being assailed beyond all endurance by reproaches and manifestations of ill will, and also by occasional missiles, they at last broke out into open revolt; having slain several of those who had at first attacked them with too much petulance, and having put the rest to flight, and wounded many with all kinds of weapons, they stripped their corpses and armed themselves with the spoils in the Roman fashion; and then, seeing Fritigern (the leader of a tribe) near them, they united themselves to him as obedient allies, and blockaded the city. They remained some time, maintaining this difficult position and making promiscuous attacks, during which they lost some of their number by their own audacity, without being able to avenge them; while many were slain by arrows and large stones hurled from slings. Then Fritigern, perceiving that his men, who were unaccustomed to sieges, were struggling in vain, and sustaining heavy losses, advised his army to leave a force sufficient to maintain the blockade, and to depart with the rest, acknowledging their failure, and saying that "He did not war with stone walls." Advising them also to lay waste all the fertile regions around without any distinction, and to plunder those places which were not defended by any garrisons. His counsel was approved, as his troops knew that he was always a very able commander in bringing their plans to success; and then they dispersed over the whole district of Thrace, advancing cautiously; while those who came of their own accord to surrender, or those whom they had taken prisoners, pointed out to them the richest towns, and especially those where it was said that supplies of provisions could be found. And in addition to their natural confidence they were greatly encouraged by this circumstance, that a multitude of that nation came in daily to join them who had formerly been sold as slaves by the merchants. ..This news from Thrace was received with great sorrow, and caused the Emperor Valens much anxiety. While he himself prepared at once to quit Antioch and go to Constantinople, he sent before him Profuturus and Trajan, both officers of rank and ambition, but of no great skill in war. When they arrived at the place where it seemed most expedient to combat this hostile multitude in detail and by ambuscades and surprises, they very injudiciously adopted the ill-considered plan of opposing the legions which had arrived from Armenia to barbarians who were still raging like madmen. Though the legions had repeatedly proved equal to the dangers of a pitched battle and regular warfare, they were not suited to encounter an innumerable host which occupied all the chains of the lofty hills, and also all the plains. ..Valens, having heard of the miserable result of these wars and devastations, gave Saturninus the command of the cavalry, and sent him to carry aid to Trajan and Profuturus. (on the next year) Valens quitted Antioch, and, after a long journey, came to Constantinople. ..He learnt from intelligence brought by his scouts, that the barbarians, who had collected a rich booty, were returning loaded with it from the districts about Mount Rhodope, and were now near Hadrianople. Fritigern was greatly alarmed; he called in all his men near the town of Cabyle, and at once made off, in order to gain the open country, where he would not be liable to be straitened for want of provisions, or harassed by secret ambuscades. At this time Valens advanced .. He was at the head of a numerous force, neither unwarlike nor contemptible, and had united with them many veteran bands, among whom were several officers of high rank, especially Trajan, who a little while before had been commander of the forces. .. Marching on with his army in battle array, he came near the suburb of Hadrianople, where he pitched his camp, strengthening it with a rampart of palisades. He then impatiently waited for Gratian (his nephew and co-emperor). While here, Richomeres, Count of the Domestici, arrived, who had been sent on by that emperor with letters announcing his immediate approach. And imploring Valens to wait a little while for him that he might share his danger, and not rashly face the danger before him single handed, he took counsel with his officers as to what was best to be done. Some .. recommended with urgency that he should at once go forth to battle; while Victor, master-general of the cavalry, a Sarmatian by birth, but a man of slow and cautious temper, recommended him to wait for his imperial colleague, and this advice was supported by several other officers, who suggested that the reinforcement of (Gratian's) army would be likely to awe the fiery arrogance of the barbarians. However, the fatal obstinacy of the emperor prevailed, fortified by the flattery of some of the princes, who advised him to hasten with all speed, so that Gratian might have no share in a victory which, as they fancied, was already almost gained. .. When the day broke which the annals mark as the fifth of the Ides of August, the Roman standards were advanced with haste, the baggage having been placed close to the walls of Hadrianople, under a sufficient guard of soldiers of the legions; the treasures and the chief insignia of the emperor's rank were within the walls, with the prefect and the principal members of the council. Then, having traversed the broken ground which divided the two armies, as the burning day was progressing towards noon, at last, after marching eight miles, our men came in sight of the waggons of the enemy, which had been stated by the scouts to be all arranged in a circle. According to their custom, the barbarian host raised a fierce and hideous yell, while the Roman generals marshalled their line of battle. The right wing of the cavalry was placed in front; the chief portion of the infantry was kept in reserve. But the left wing of the cavalry, of which a considerable number were still straggling on the road, were advancing with speed, though with great difficulty; and while this wing was deploying, not as yet meeting with any obstacle, the barbarians being alarmed at the terrible clang of their arms and the threatening crash of their shields (since a large portion of their own army was still at a distance) sent ambassadors to ask for peace. The emperor was offended at the lowness of their rank, and replied, that if they wished to make a lasting treaty, they must send him nobles of sufficient dignity. They designedly delayed, in order by the fallacious truce which subsisted during the negotiation to give time for their cavalry to return, whom they looked upon as close at hand; and for our soldiers, already suffering from the summer heat, to become parched and exhausted by the conflagration of the vast plain; as the enemy had, with this object, set fire to the crops by means of burning faggots and fuel. To this evil another was added, that both men and cattle were suffering from extreme hunger. .. In the mean time the cavalry of the Goths had returned and with them a battalion of Alani; these descending from the mountains like a thunderbolt, spread confusion and slaughter among all whom in their rapid charge they came across. And while arms and missiles of all kinds were meeting in fierce conflict, and Bellona (goddess of war), blowing her mournful trumpet, was raging more fiercely than usual, to inflict disaster on the Romans, our men began to retreat; but presently, roused by the reproaches of their officers, they made a fresh stand, and the battle increased like a conflagration, terrifying our soldiers, numbers of whom were pierced by strokes from the javelins hurled at them, and from arrows. Then the two lines of battle dashed against each other, like the beaks (or rams) of ships, and thrusting with all their might, were tossed to and fro, like the waves of the sea. Our left wing had advanced actually up to the waggons, with the intent to push on still further if they were properly supported; but they were deserted by the rest of the cavalry, and so pressed upon by the superior numbers of the enemy, that they were overwhelmed and beaten down, like the ruin of a vast rampart. Presently our infantry also was left unsupported, while the different companies became so huddled together that a soldier could hardly draw his sword, or withdraw his hand after he had once stretched it out. And by this time such clouds of dust arose that it was scarcely possible to see the sky, which resounded with horrible cries; and in consequence, the darts, which were bearing death on every side, reached their mark, and fell with deadly effect, because no one could see them beforehand so as to guard against them. But when the barbarians, rushing on with their enormous host, beat down our horses and men, and left no spot to which our ranks could fall back to deploy, while they were so closely packed that it was impossible to escape by forcing a way through them, our men at last began to despise death, and again took to their swords and slew all they encountered, while with mutual blows of battle-axes, helmets and breastplates were dashed in pieces. Then, you might see the barbarian towering in his fierceness, hissing or shouting, fall with his legs pierced through, or his right hand cut off, sword and all, or his side transfixed, and still, in the last gasp of life, casting round him defiant glances. The plain was covered with carcases, strewing the mutual ruin of the combatants; while the groans of the dying, or of men fearfully wounded, were intense, and caused great dismay all around. Amidst all this great tumult and confusion our infantry were exhausted by toil and danger, till at last they had neither strength left to fight, nor spirits to plan anything; their spears were broken by the frequent collisions, so that they were forced to content themselves with their drawn swords, which they thrust into the dense battalions of the enemy, disregarding their own safety, and seeing that every possibility of escape was cut off from them. The ground, covered with streams of blood, made their feet slip, so that all that they endeavoured to do was to sell their lives as dearly as possible; and with such vehemence did they resist their enemies who pressed on them, that some were even killed by their own weapons. At last one black pool of blood disfigured everything, and wherever the eye turned, it could see nothing but piled-up heaps of dead, and lifeless corpses trampled on without mercy. The sun being now high in the heavens, having traversed the sign of Leo, and reached the abode of the heavenly Virgo, scorched the Romans, who were emaciated by hunger, worn out with toil, and scarcely able to support even the weight of their armour. At last our columns were entirely beaten back by the overpowering weight of the barbarians, and so they took to disorderly flight, which is the only resource in extremity, each man trying to save himself as well as he could. Just when it first became dark, the emperor being among a crowd of common soldiers, as it was believed— for no one said either that he had seen him, or been near him—was mortally wounded with an arrow, and, very shortly after, died, though his body was never found. Others report that Valens did not die immediately, but that he was borne by a small body of picked soldiers and eunuchs to a cabin in the neighbourhood, which was strongly built, with two stories; and that while these unskilful hands were tending his wounds, the cottage was surrounded by the enemy, though they did not know who was in it; still, however, he was saved from the disgrace of being made a prisoner. For when his pursuers, while vainly attempting to force the barred doors, were assailed with arrows from the roof, they, not to lose by so inconvenient a delay the opportunity of collecting plunder, gathered some faggots and stubble, and setting fire to them, burnt down the building, with those who were in it. But one of the soldiers dropped from the windows, and, being taken prisoner by the barbarians, revealed to them what had taken place, which caused them great concern, because they looked upon themselves as defrauded of great glory in not having taken the ruler of the Roman state alive. This same young man afterwards secretly returned to our people, and gave this account of the affair. Nor, except the battle of Cannae, is so destructive a slaughter recorded in our annals; though, even in the times of their prosperity, the Romans have more than once had to deplore the uncertainty of war, and have for a time succumbed to evil Fortune. Such was the death of Valens, when he was about fifty years old, and had reigned rather less than fourteen years. Three other battles occurred near Adrianopolis in 718, 813 and 972 because the town blocked the road to Constantinople to the Bulgarians. In 1205 the Bulgarians defeated the Crusaders of the Fourth Crusade. In 1365 the Ottomans occupied the town and soon after they relocated their capital from Bursa to Edirne, as they called the town founded by Hadrian. 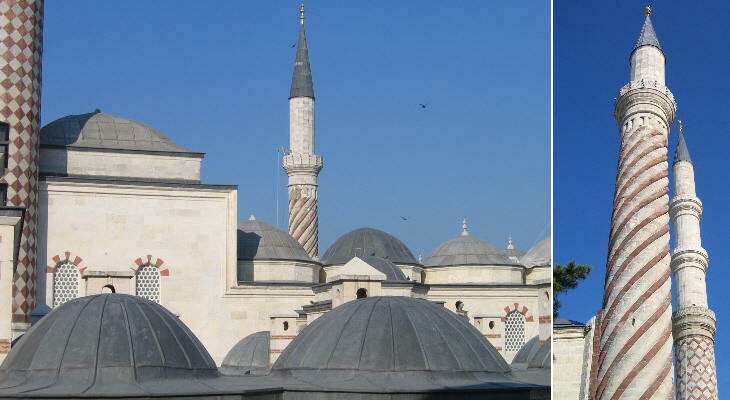 The sultans promoted the development of their new capital and between 1403 and 1414 they built a large mosque (Eski Camii) which, while resembling those of Bursa, was characterized by white and red "stripes", a feature of Byzantine buildings. The Mevlevi Order was founded in 1273 in Konya. Its members are known as the Whirling Dervishes, due to their practice of whirling as a devotional act. Sultan Bayezit I married a descendant of the founder of the order. His son Sultan Mehmet I and after him Sultan Murad II were great protectors of the order. A Mevlevi monastery with an adjoining mosque was built by Murad on a hill remote from the city centre. For this reason they remind the observer of a Capuchin site. It is interesting to remark that Ottoman art by moving to Europe became less interested in the elaborate decoration of its buildings and more on their overall design. A large mosque built by Sultan Murad II in 1447 was the first to have a minaret with three galleries; they became a feature of Ottoman art. The mosque is characterized by a large maqsura, a private area in the prayer hall enclosed by a wood screen for the sultan and his entourage. The minarets were built one after the other and they vary in height and design. 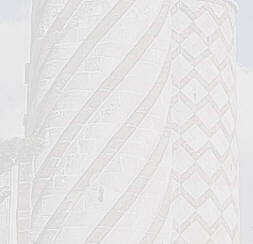 The whole complex is characterized by the use of red and white stone. The spiral minaret is similar to the Burmali minaret at Amasya, a town in Northern Anatolia which had been the starting point of Sultan Mehmet I's fight to conquer the throne. A bedesten is a domed masonry structure built for storage and safe keeping of valuable goods. 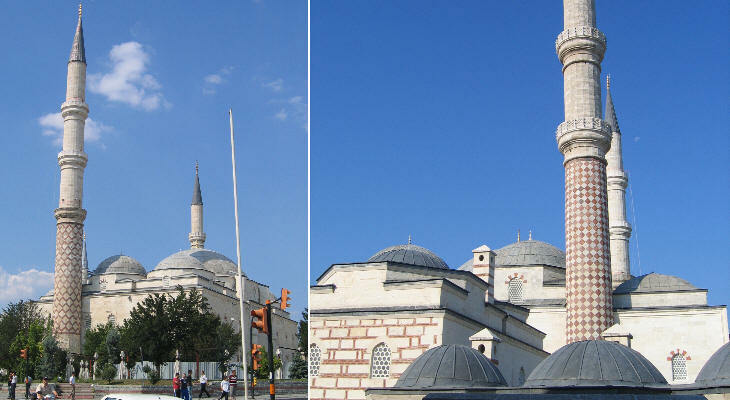 Sultans often built them as a resource for a mosque; in the case of Edirne the bedesten belonged to Eski Camii. Carsi means bazaar and it consists of covered parts and open air sections. 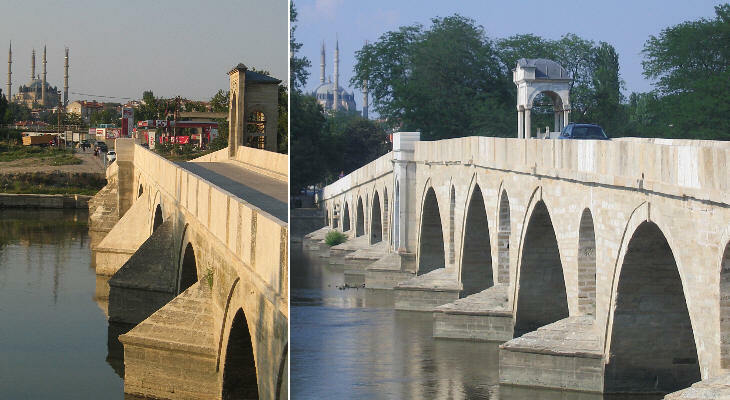 In Edirne both bedesten and carsi are still used for their original purpose. 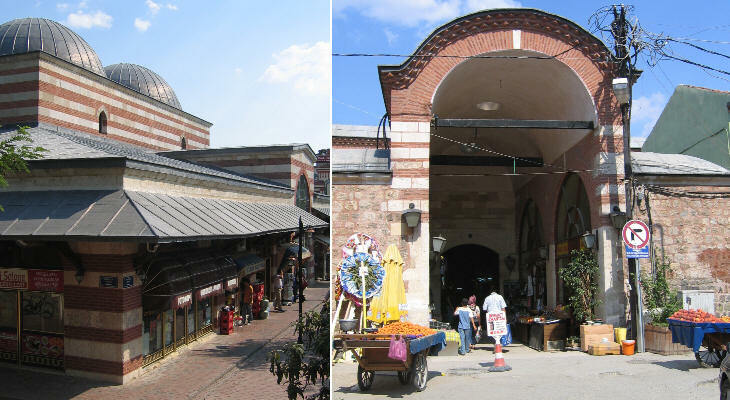 XVIth century Rustem Pasha Caravanserai (attributed to Mimar Sinan): (left) exterior; (right) upper floor of the main courtyard with chambers to accommodate merchants and their servants. Caravanserais (or hans) were not just roadside inns where merchants and their animals could rest. They also played an important role in the Ottoman fiscal system as they permitted the control of the flow of trade and the levying of taxes. 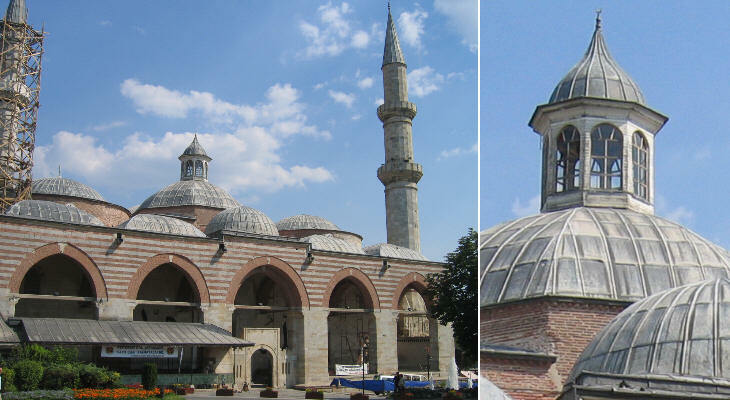 That of Edirne (actually two hans one next to the other) had a small mosque covered by a dome decorated with spirals. The residence of the sultans was located out of town, on the right bank of the River Tunca. There were many separate buildings and pavilions surrounded by a wood where the sultans went hunting. The buildings were damaged by an earthquake in 1753 and mostly by the effects of the two Russian occupations (1829 and 1878) of the town. What was left received a final blow by a five months' siege of Edirne by the Bulgarians in 1913.